December Meeting (Continued) Mrs. Adams asked each individual to answer to herself this pertinent question. Mrs. Olson then took over the chapter in the Study Book "Shadows over America several assisting. Next meeting to be with Mrs. Martz. Jan 20 '59 at her home on Main St. Meeting closed with all repeating the 23rd Psalm. "January Meeting" "W.C.T.U." The regular monthly meeting of the W.C.T.U Unit met at the home of Mrs. Rose Martz Jan. 20, '59. with Mrs. Adams presiding. After the salute to the flags Mrs. Martz led the devotions, ending with prayer and Scripture from the 84th Psalm. Mrs Adams read a letter in regard to "liquor by the drink." All present a petition against it was signed also against "Liquor Ads on T.V." Minutes of last meeting read and approved. Treas report followed. It was decided to give a gift to the "March of Dimes" and a collection of $2.55 was obtained for the cause. Program followed with Mrs. Ralph Allen in charge. "Liquor on Planes" - Lauger Bill was discussed. Mrs Seuenberger read steps for voting. Mrs. Ewing read a chapter from "Shadow over America." There were seventeen members present one new member Mrs. Kenneth Headland of the Northside Friends joined us. Adjournment Grace L. Foster Sec Who in Iowa Wants Liquor by the Drink? 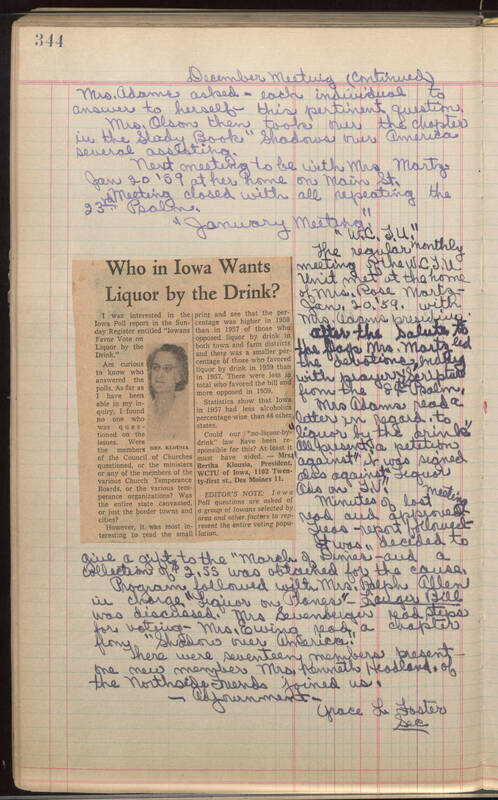 I was interested in the Iowa Poll report in the Sunday Register entitled "Iowans Favor Vote on Liquor by the Drink." Am curious to know who answered the polls. As far as I have been able in my inquiry, I found no one who was questioned on the issues. Were the members of the Council of Churches questioned, or the ministers or any of the members of the various Church Temperance Boards or the various temperance organizations? Was the entire state canvassed, or just the border towns and cities? however, it was most interesting to read the small print and see that the percentage was higher in 1959 than in 1957 of those who opposed liquor by drink in both town and farm districts and there was a smaller percentage of those who favored liquor by drink in 1959 than in 1957. There were less in total who favored the bill and more opposed in 1959. Statistics show that Iowa in 1957 had less alcoholics percentagewise than 44 other states. Could our "no-liquor-by-drink" law have been responsible for this? At least it must have aided. - Mrs. Bertha Klousia, President, WCTU of Iowa, 1102 Twenty-first st., Des Moines II. EDITOR'S NOTE: Iowa Poll questions are asked of a group of Iowans selected by area and other factors to represent the entire voting population.